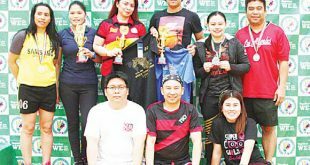 KUWAIT CITY, Sept 22: The Filipino Badminton Association of Ahmadi (FBAA) bagged the overall championship in the 3rd “Inter Club Friendship One-day Tourney” dubbed “4 Feathers Cup” on Friday that was hosted by the FBAA at the Fahaheel Sports Club. 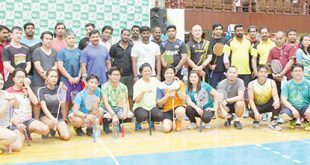 The Four Feathers Cup is held every three months by four premier badminton clubs in Kuwait namely the Filipino Badminton Committee (FBC), Hapi Pipol, Filipino Badminton Club in Kuwait (FILBACK) and the FBAA. 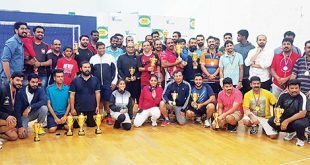 The badminton tournament inspired by the feather, that makes a shuttlecock aerodynamically stable aims at promoting friendship through badminton across Kuwait and the Middle East. 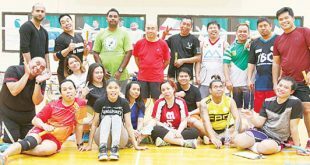 FBAA Players dominated the Intermediate Category with Joemar Malaya and Gerry Punzalan winning the first place followed by fellow FBAA members Ethelbert Guarin and Rhunell Cervo as runner-up. 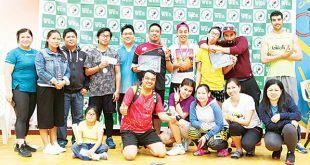 Meanwhile, Jean Acasio and Sheryl Vizcara of FBAA clinched the top spot in the Ladies Category. In the Novice Category, Jumar Menes and Sonny Custodio won first runner-up. 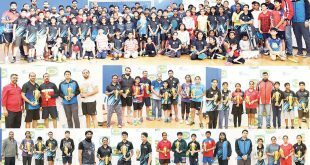 The next host of the Four Feathers Tournament will be the Hapi Pipol in November this year while FBC will be in charge on February 2016 and FILBACK on May 2016.